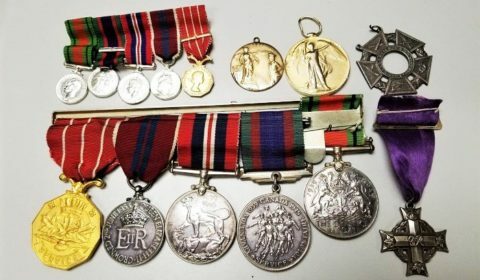 MIDLAND — First and Second World War medals stolen in a Midland home break-in last month have been recovered and turned over to the grateful families. All the missing medals have now been recovered from Midland break-in. owners of the late veterans. The owners were two members from the same Midland family who survived their conflicts in the great wars and have since passed away. The surviving families of these servicemen are very pleased with the return of the medals and gratefully thank everyone who played a part in their return, say police. On January 28 the OPP were called to a reported theft in Waubaushene, in the Township of Tay. During the investigation, officers found a number of Canadian Forces Service Medals that matched property stolen from a Town of Midland home that was victimized by a break, enter and theft earlier in January. Officers then seized the medals and returned them to the delighted rightful owners. However, not all of the medals were recovered. With the help of the public police located the remaining missing medals and turned them over to the family. seeking the assistance of the public in locating another ribbon bar still outstanding from the theft of Canadian Forces Service medals similar to those recovered.